Microsoft tracks the location of its mobile users even after customers turned the software off, a lawsuit filed on Wednesday alleges. The legal action claims that owners of Windows Phone 7 smartphonesare being unwittingly tracked when the camera on their phone is switched on. The lawsuit, filed in a Seattle federal court, claims that Microsoft collects data about the whereabouts of its users even after customers have opted out of location tracking. Microsoft declined to comment on Thursday morning. The lawsuit follows mounting concern about how technology giants, including Apple and Google, record users’ private data. Microsoft, Nokia, Apple and Google were called before the US Congress in April to explain their privacy policies after security researchers uncovered hidden location-tracking software in iPhones. Google Android phones weresubsequently found to gather location data, but required users’ explicit permission. The lawsuit alleges that Microsoft’s letter to congress, which claimed that location data is collected “always with the express consent of the user”, was “false”. The claim, filed by Rebecca Cousineau, says that Microsoft transmits data including coordinates of a customer’s location when the phone’s camera is switched on. 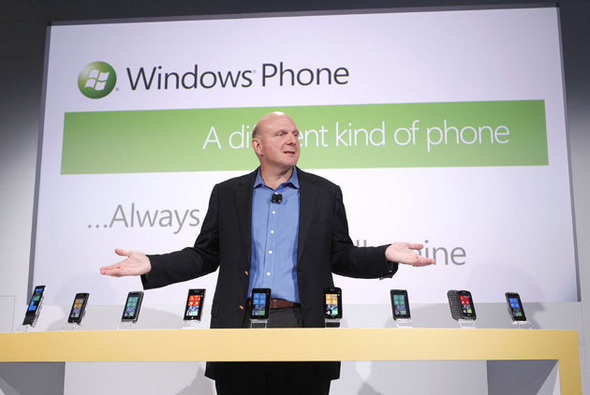 According to the lawsuit, hidden tracking affects smartphones using Microsoft’s Windows Phone 7 software, such as the HTC 7 Mozart and the Samsung Omnia 7. Microsoft is understood to be preparing a response to the claims. In its representation to US Congress in May, the Redmond, Washington-based company said that tracking users’ location helps “deliver more useful and relevant experiences to users”. It adds: “To provide these rich experiences, Microsoft collects limited information necessary to determine the approximate location of a device. Collection is always with the express consent of the user and the goal of our collection is never to track where a specific device has been or is going. Google lifted the veil on its chrome laptop Wednesday and also launched a somewhat Quixotic initiative to dent Microsoft’s dominance in the enterprise with a program that provides software, laptops and support for $28 per month per user. As Apple continues to make modest advances in the office now Google wants a piece of the action and is offering up an IT-displacing idea that seeks to emphasize peace of mind as much as it does price. The idea is simple. Businesses spend a lot of money on IT support, hardware and software — the core of which is commodity computers running a flavor of Windows OS and Microsoft Office. They hold on to computers as long as they can both for reasons of cost and to simplify support, which generally is provided locally through the IT department. 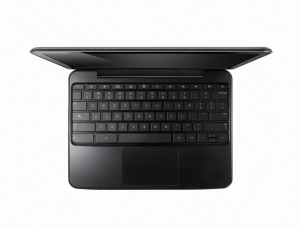 Google’s alternative provides small, standardized laptops from Samsung and Acer running its Chrome OS, which debuted in December. The new Chromebooks, as Google dubbed them, are fully web-based — both programs and storage is “in the cloud.” Users have access to use a wide range of productivity software, like Google Docs, Salesforce CRM and photo editing software, with no installation or and upgrades automatically performed in the background. Google provides all support, including repair and replacements. Google has made less ambitious plays for the enterprise before. It’s first attempt the paid version of Google Docs, has had some success with smaller businesses, but hasn’t turned into a significant revenue source for Google. And, given its Nexus One past, Google it isn’t exactly known for its customer service. But diversification is seen as key for the search giant, since its core advertising products are still responsible for more than 90 percent of its revenue. So we see a push into the mobile space with Android — a direct blow at Apple’s smartphone and tablet business — and a challenge to Microsoft in its workplace wheelhouse. Microsoft’s historic and prolonged dispute with U.S. regulators over antitrust violations has finally come to an end. And how things have changed. May 12 marks the expiration of a consent decree the software giant signed with the Department of Justice in 2002, an agreement that narrowly saved Microsoft from being broken up after it was found guilty of using its dominant position to stifle competition. When Microsoft announces its fiscal third quarter earnings after the market closes today, most analysts will zero in on one data point–how Windows is selling. “Clearly, the PC market is under pressure,” said Adam Holt, a Morgan Stanley analyst. And since the vast majority of PCs run Windows, Microsoft earnings are under some pressure too. There’s little doubt that Microsoft will report its best-ever fiscal third quarter revenue. But with slowing PC shipments, Windows, which should account for about 28 percent of Microsoft’s overall sales this quarter, will be a drag on earnings. Slowing sales of Windows, long the fuel for Microsoft’s economic engine, is cause for some concern. On Tuesday, Holt cut $200 million from his projections for Windows sales in the fiscal third quarter to $4.47 billion, a 4 percent decline from the year-ago period. And since Windows accounts for about 28 percent of Microsoft’s overall revenue, Holt nudged his overall quarterly estimates downward, expecting the company to earn $4.47 billion on sales of $15.8 billion. Microsoft issued a patch for its Word software to comply with a court ruling that it infringed on patents relating to the use of XML or extensible markup language in its flagship word processing software. The US Court of Appeals for the Federal Circuit had ordered Microsoft to stop selling Word programmes containing the infringing code from Jan 11, 2010. It also upheld jury-imposed damages of $290 million. The ruling came in an appeal by Microsoft against a Texas jury verdict last August that found Microsoft had violated patents owned by Canadian software company i4i Inc.
“A small company was practicing its patent, only to suffer a loss of market share, brand recognition and customer goodwill as the result of the defendant’s infringing acts,” the three-judge panel said in court documents. The patch was made available to computer makers to install on new machines preloaded with the Word software and strips Word and other Office programs of custom XML editing capabilities which is used by companies to link their data to Word documents. Microsoft Office, which includes Word, PowerPoint, and Excel is used by millions of businesses and consumers and accounted for more than $3 billion in worldwide sales in Microsoft’s most recent fiscal year.